A man suspected of stealing a sport utility vehicle with a 4-year-old boy inside at a Colorado gas station and carjacking two vehicles during a high-speed freeway pursuit was arrested Wednesday morning when officers tracked him down as he tried to scale a fence after crashing at an intersection. The red Ford Edge was reported stolen Wednesday morning from a gas station north of Denver (map) where police said surveillance cameras captured an image of the subject, wearing a yellow and black coat, at the cashier's counter. Denver television helicopters soon spotted a vehicle matching that Edge's description speeding along Interstate 25. The vehicle's owner apparently left the SUV's engine running when she entered the fuel station, police said. After about a half hour, the driver stopped and carjacked a minivan with two people inside. The occupants escaped the vehicle and the man drove across a freeway embankment and swerved across lanes as he traveled the wrong way into oncoming traffic. 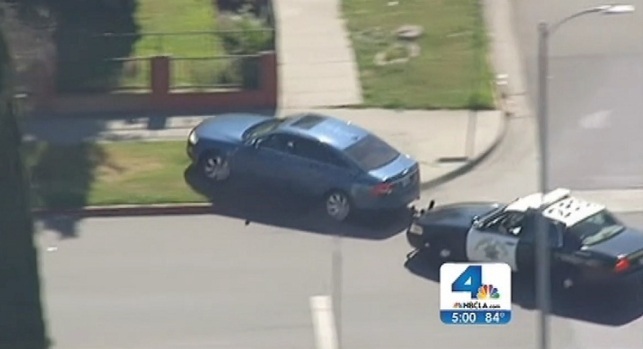 Southern California is notorious for its police pursuits. Recent months have seen a remarkable assortment of chases, from the infamous "money toss," to the man huffing on colorful balloons as police close in, to the pink-hoodied driver who sprinted from a getaway car while talking on her cell phone. As the moments from eight recent chases captured here illustrate, car chases defy logic and common sense, putting the police and the public at risk. Officers threw stop sticks on the highway but they failed to stop him as he hugged the freeway median. A Colorado State Trooper was seriously injured during the attempted traffic stop and reamined in surgery late Wednesday morning. "This individual was a very dangerous person," said Douglas County Undersheriff Tony Spurlock. "He was not going to stop committing crimes." The driver repeatedly rammed into the back of a Nissan Sentra on the highway before striking another vehicle on a freeway exit ramp. After that vehicle spun to a stop, the carjacker pulled the female driver from the car and sped off. The man eventually crashed the sedan into another vehicle at an intersection and ran to the driver's side door. 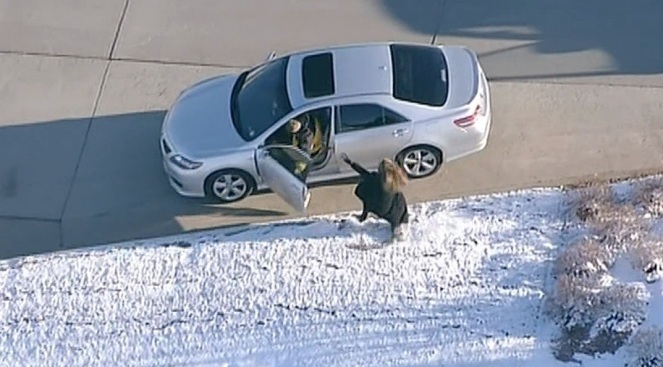 After failing to open the door, he ran from the intersection, slipped on snow and ice and attempted to climb a fence before officers chased him down and took him into custody. "There are a lot of people who have just lived a horrific event," said Douglas County Sheriff Dave Weaver. The 4-year-old boy was found safe, KUSA-TV reported. His mother told reporters she left the vehicle's engine on when she ducked into the store. "When I came out of the gas station my car was gone," said Marta Rodriguez. "It's crazy. "I'm very happy to have my son." The suspect, identified as 28-year-old Ryan Stone, was hospitalized, but details regarding his condition were not immediately available. He will be booked on suspicion of kidnapping, assault, carjacking and other charges in connection with at least six collisions involving other vehicles, police said. He was wanted by police for failing to appear in court March 4 on a "dangerous drug" charge.